Because they are social animals, dogs hate being left alone. 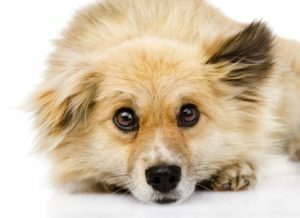 In fact, the most common of dog fears is separation anxiety. There are always exceptions to the rule, but for the most part a dog wants to be with her pack, be it you, your family, another dog, a cat, or even a bird. There is a sense of insecurity and vulnerability when a dog is left alone. Feeling abandoned, some will panic. By relieving himself all over the house, a dog reassures himself this territory is his. His path of destruction is simply a way of reducing boredom and separation anxiety. Doing so calms dog fears. Dogs whine, bark and howl intuitively, in hopes that you will hear and return to them. When separated in the wild, it is how they find each other. They have no concept of work, shopping or school. To your dog, each time you leave the house, you have gone out on a hunt without them, and may never return. A closed door to your dog is tantamount to plopping a boulder at the entrance of their den. Never put your dog in a room with a closed door. Use a half door (it is less defining) or baby gate, so they can smell, see, hear and sense they are not totally cut off from their comfort zone and environment. 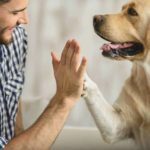 There are a number of steps you can take, to help your dog feel less anxious while you are gone and reduce dog fears. First and foremost, dog proof the area, just as you would for a child. Remove anything they can chew or choke on, remove all chemicals and unplug anything electrical they have access to. They will get into anything, when bored or feel anxious. Most dogs sleep practically the entire time you are gone, when in a protected restricted area or crate. That’s why they are so full of energy when you walk through the door. Give them a comfy bed, a few safe, tough toys or chew items, a couple of treats, and just enough water to wet their whistle. 1. CRATE/WIRE – A crate is not as cavernous as an empty room or the entire house. Most dogs are quite comfortable and surprisingly to some, feel extremely secure in their crate. Inherently, to them it’s a sheltered, secure den. 2. GATE: Certain dogs do not mind being restricted, as long as they can see what’s going on in the rest of the house. If that’s the case, a high quality baby or dog gate is a great solution to the problem. Your dog won’t have the run of the house for a search and destroy mission, yet they won’t feel rejected. It is also a great way to keep the dog from being underfoot, yet feel included, when you have a house full of guests. Make sure your dog learns to respect the gate, before leaving them for any extended period of time. 5. NOISE – White noise works wonders. 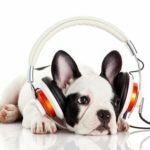 A radio, in another room, with the volume set low, on a soft music, talk show or even the weather channel, offers your dog a sense of tranquility and human companionship. It also helps filter distracting outside noises. 6. OBEDIENCE TRAINING – Find a local trainer who applies positive reinforcement, punishment-free methods of training. Spend quality time every day working on obedience skills with your dog, to build up their self-confidence. They appreciate your undivided focus on them, and you get a well-behaved dog. It’s a win-win situation. 7. EXERCISE, EXERCISE, EXERCISE – Tire your dog out, BEFORE you put them up for the day. A vigorous 20-30 minute walk, or tiring game of “FETCH” before leaving them, will help take the edge off. A tired dog is a good dog. 8. HELLOS & GOOD BYES – Keep the hellos and good-byes low keyed. Don’t make your entrance and exit melodramatic. Your dog feeds off your behavior and emotions. If they whimper, whine or bark as you leave, go back, make a firm correction, then ignore them, and walk out the door. 9. CHANGE YOUR ROUTINE – Nearly all of us are creatures of habits. We don’t realize it, but unconsciously we follow a patterned routine, before leaving the house. Dogs are very tuned in to it. Change your routine daily, so your dog does not get anxious, sensing your departure. Get your keys before your brush your teeth. Put your shoes on, then grab a magazine and act as if you are reading it or pour yourself a cup of coffee and sit. Then get up and walk out the door. No good-byes! When they see you are not going through your regular departure ritual, they will drop their guard, and be less anxious. 10. 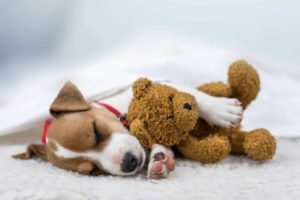 DOG WALKER /DOGGIE DAYCARE – If your dog must be left alone for 8 or more hours per day, consider using a dog walking service, and/or enrolling them in a doggie daycare at least twice a week. 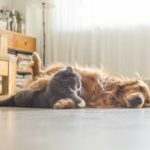 Not only will your dog will appreciate the social interaction with humans and dog playmates; it breaks the monotony of their day, and gives them something to look forward to. 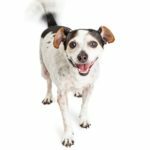 Work at building up your dog’s self-confidence and break down dog fears of being left alone, by short separation exercises. Begin with 5-10 minutes; then slowly lengthen the time. It takes a fervent commitment on your part, but it reassures your dog, you will return to them. BOTTOM LINE: Ultimately, nearly all dogs adjust to human routines. However, there are a few, who will never adjust to being left behind. To reduce dog fears and keep them, your house and belongings safe, definitely work on crate/wire kennel training. Your dog will gradually get adjusted to it. I believe in giving them plenty of exercise before and after I get home from work. I also give them kong-filled treats before I leave. My dogs love the kongs so much that they RUN to their crates because they know that’s where they they will get them. It’s almost like they WANT me to leave, LOL. I have one liile Chi who crys when i leave the room. If i go to the bathroom or laundry room etc. He cries real tears and its so hard on him. He dorsnt like other dogs. Doesnt play with toys either. The only comfort is his blanket. Hes 4 and i think hes suffering from fear of abandonment i dont really know.